In Jackpot Factory you’re going to find a Microgaming slot machine, with a rather interesting theme. It shows you what’s going on behind the scenes in a factory where jackpots are being made, giving the entire thing a bit of an industrial look. There are both factory workers and rich people on the reels, pots of gold and overworked robots. 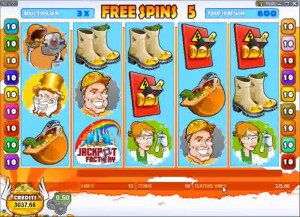 You get a rather average layout, with 5 reels and 15 bet lines, but the game does very well feature wise, with free spins, 5x multipliers, scatters and wilds. There is also a $20,000 top jackpot. Jackpot Factory offers you all the cool features you could want, starting with a wild symbol, with two scatters and free spins with high multipliers. The Jackpot Factory Logo is an interesting one, with a rainbow going around a castle of sorts. This is the wild symbol, plus it can award the slot’s biggest prizes of up to 4,000x. If the wild doesn’t form its own combo of two to five symbols, it at least tries to help you out by being part of other combinations. It can take the role of any other symbol, as long as it’s a regular one. Another feature would be the first of the two scatters, with the pot of gold that has wings. The only thing it does is award a prize, based on the total number of symbols that are present. With the minimum of three you get 3x the wager, while the maximum of five brings you 75x. The second scatter will have its own prizes to give away, but they only go up to 50x the bet when all five are present. The image used on it is that of a Switch. 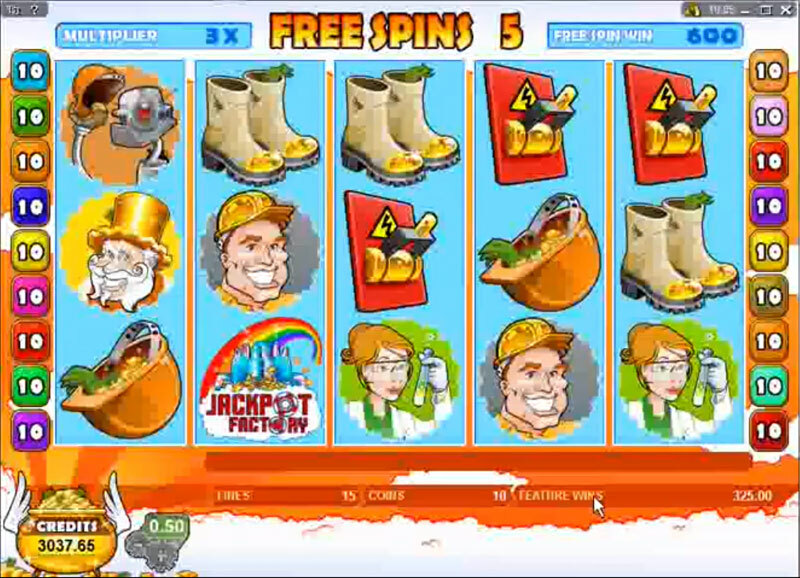 The Switch scatter is also responsible for starting up the free spins. Up to 10 spins may be won in the bonus feature that follows, with maximum multipliers reaching 5x. What I enjoyed seeing in this feature is that the free spins come with guaranteed wins, so even if you don’t have a winning combo that round, you can still expect a prize which is worth 10 times the line bet. For each payline that you use, you have to place a line bet. You use between 1 and 10 coins on each line, with as many as 150 coins in the maximum bet. Coin denominations are between $0.01 and $0.50, so the total bet can reach a value of $75. 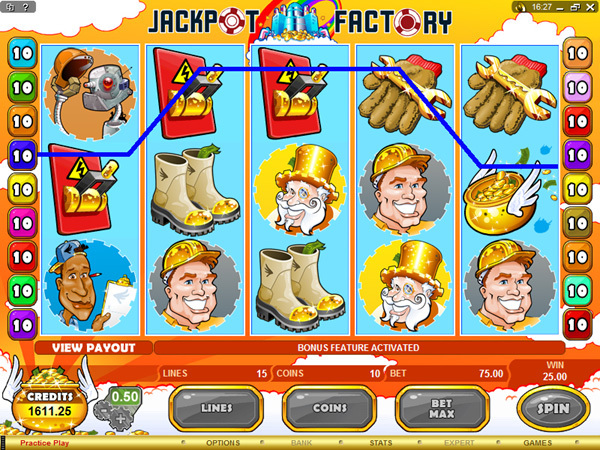 You can get up to 4,000 times the line wager if you get the jackpot, which will bring you up to 40,000 coins ($20,000). The design is attractive enough, with an industrial influence but without the usual dark colors that factories would have. Instead, it’s a game with light colors, with yellows, blues and reds used in the symbols. The characters all seem quite happy, which shows you why it’s great to work in a jackpot factory, as opposed to a regular one. Only themed symbols were used, another plus in its favor. 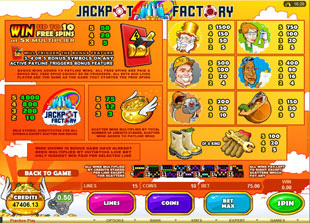 Symbols: Jackpot Factory Logo (wild, 4,000x), Pot of Gold (75x bet, scatter), Switch (scatter, 50x bet), Factory Owner (1,500x), Scientist (750x), Worker (500x), Man with checklist (400x), Robot (200x), Helmet (150x), Boots (100x) and Gloves (100x). The jackpot aspect is a disappointment, since you expect huge prizes when you see titles like these, and $20,000 is average for the industry. It’s a decent game otherwise. 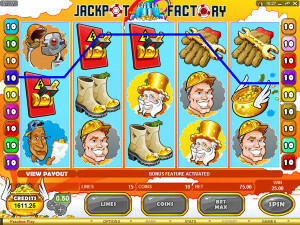 The Jackpot Factory slot machine is offered through the Microgaming platform, so if you want to play it for real or just to practice, look out for casinos that use it.